We are delighted to announce our 7th consecutive participation at the London Fashion Week, one of the biggest congregations of fashionistas in the world. This year’s exhibition, entitled 'Standpoint', explores the intersections between the multiple layers of local and global – from reflections on the past and personal introspection, to the opportunities afforded by the wired world. Shining a spotlight on young creative talent, the Romanian project brings together five innovative designers boasting a striking sartorial style imbued with daring cuts and colours: Smaranda Almășan, Emese Bakó, Andreea Castrase, Sabina Pop, and Ancuța Sarca. The exhibition is designed by Attila Kim. 'Standpoint' is part of the British Council and British Fashion Council’s International Fashion Showcase 2017, in association with London Fashion Week. 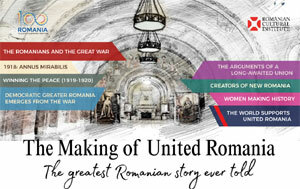 The project is set up by the Romanian Cultural Institute in London in partnership with The Institute Bucharest and Romanian Design Week. Smaranda Almăşan is a high fashion design label whose collections are characterized by elegant designs, fine cuts and sharp silhouettes. The style is avant-garde to wear every day, giving individuals a better opportunity to dress experimentally. Established in 2009 by designer Smaranda Almăşan, the studio is based at the Paintbrush Factory in Cluj, a collective space for contemporary arts. In the past few years, Smaranda has launched a few collections in Bucharest and participated at the Fashion Fairs in Düsseldorf, Munich and Vienna. Emese Bakó completed an internship at the British fashion house Giles Deacon, after which she has worked for the fast fashion company H&M in Stockholm. Her designs are a visual representation of desirable attitudes and unique delicacy. Refined and sophisticated cuts, feminine and simple details, silk velvet, satin silk and brocade fabrics, handmade embroidery, beading and other techniques are just a few words to describe Emese Bakó’s designs. Andreea Castrase has received important awards and recognitions during her career as a fashion designer: in 2015 she was awarded the Best Young Designer award at Elle Style Awards and the Best Young Designer at Beau Monde Awards. She has gained experience while working for brands such as Ann Demeulemeester and H&M, and has developed an aesthetics that could be defined as timeless, often austere but always managing to convey a certain emotion. Sabina Pop is a ready to wear design label. Influenced by the connection between contemporary art and design, Sabina is currently enrolled in the PhD programme of the University of Art and Design in Cluj-Napoca. Her pieces are wearable yet daring and are characterised by bold colours and various patterns in playful juxtapositions. However, at the same time, the silhouettes are clean to the point of minimalism, while the volumes are often oversized and geometric. Ancuţa Sarca is an explorer who hasn’t lost her innocent curiosity and constant questioning of cultural concepts, and whose originality was rapidly noticed not only by the Romanian fashion press but also by acclaimed label Meadham Kirchhoff, winning her an internship in its London Studio. In her most recent collection, an eclectic composition mixing 18th century opulence with 20th century subcultures, Ancuţa translates concepts of social and cultural movement into the feel of unconventional materials, vibrant colours and hi-tech fabric experiments. Free admission but pre-registration is advised. Please pre-register here.